Kultur Video offers an authoritative and comprehensive study of art and artists through the ages. The six films in this series, Landmarks of Western Art: A Journey of Art History Across the Ages , document the world's great artistic accomplishments from the medieval period to post-impressionism, Botticelli to van Gogh. 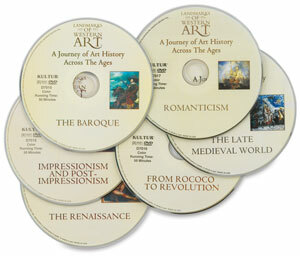 The use of sophisticated computer graphics and newly filmed footage shot at the world's finest galleries combine with commentary from leading art historians.